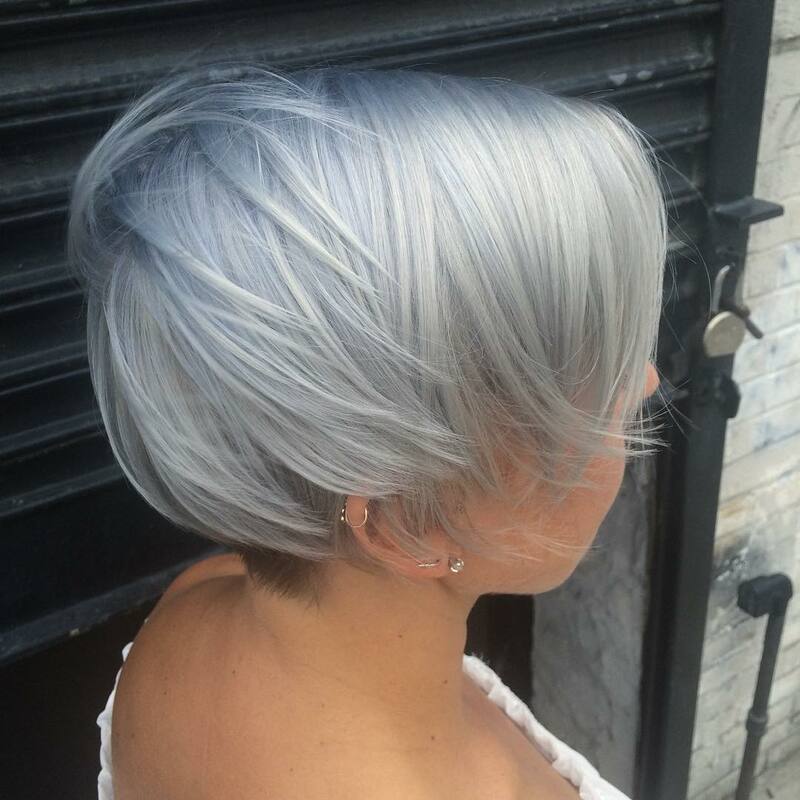 This post is all about the gray/silver hair how to get it, blend it, embrace it or conceal it. Let’s start with this badass client who flew in from San Francisco for the Women’s March on Washington. Donna Rae first cut her hair into a bitchin’ shag and then went in with bleach around the sides and bangs to lighten hair to an almost white. Donna then toned the hair with a steely silver by Redken ShadesEQ. This client wanted to embrace and blend the grays she has. This will be low maintenance for her since the root of the panels are concealed by super dope texturized layers. 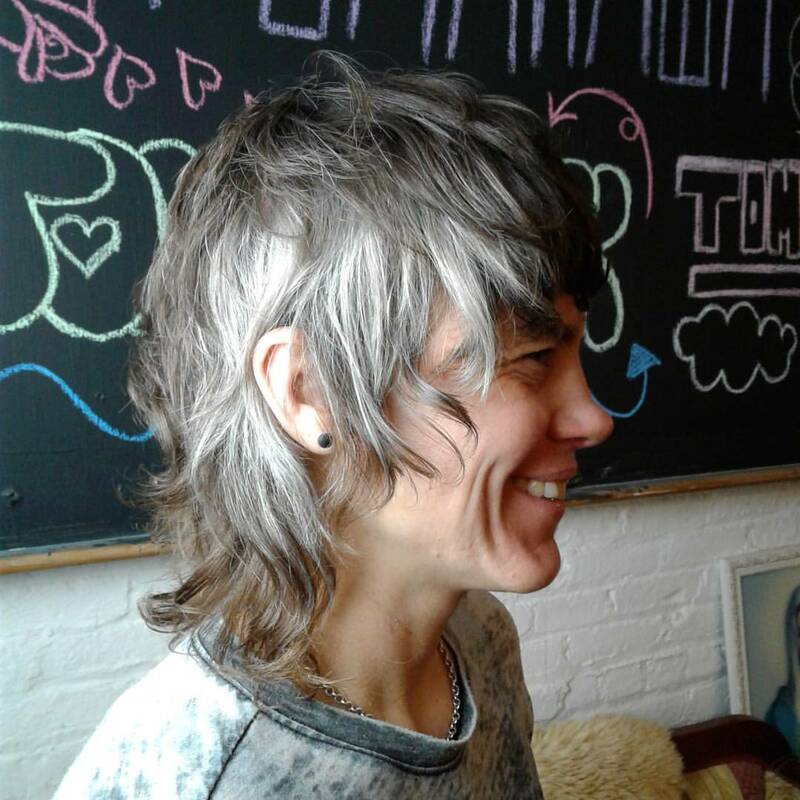 Donna Rae gave this client a rockin’ shag and placed several steely silver panels around the sides and bang. Now let’s get into the more complicated grays. Getting this look is not the easiest especially if you have dark hair. Our client below came in with already pre-lightened hair it just wasn’t light enough to hold the gray tones. That’s the trickiest part of gray/silver hair you have to get the hair really light, past orange and yellow to an almost white, if not the hair will look more green. You really have to use color theory and lots of patience to get this color. It may take several visits to the salon for desired results. Natalia Michele did a full balayage leaving a more natural root. She used permanent color after bleaching to achieve this charcoal effect. What’s great about balayage is the built in natural root. Touchups are up recommended every 2-4 months. Some clients choose to come in every 6 months or later for a more ombre effect. Toners will wear out in about 4 weeks you can maintain it at home with demi permanent color like Manic Panic, Special Effects or Pravana you can also just book for a glaze/gloss in between your lightening services. Natalia Michele kept a natural root and blended several shade gray to achieve this multidimensional look. Peep this silvery white hair on our next client. Cut and color was done by Natalia Michele doing a full virgin double process. Maintaining a color like below is a commitment of coming in every 6-8 weeks to get the roots done and toner refreshed. To keep her white/silver we recommend using a purple/violet shampoo like Clairol Shimmer Lights and Matrix So Silver. Weekly or monthly masks such as Hask placenta or Redken Extreme Anti-snap help deliver protein to weak or damaged. 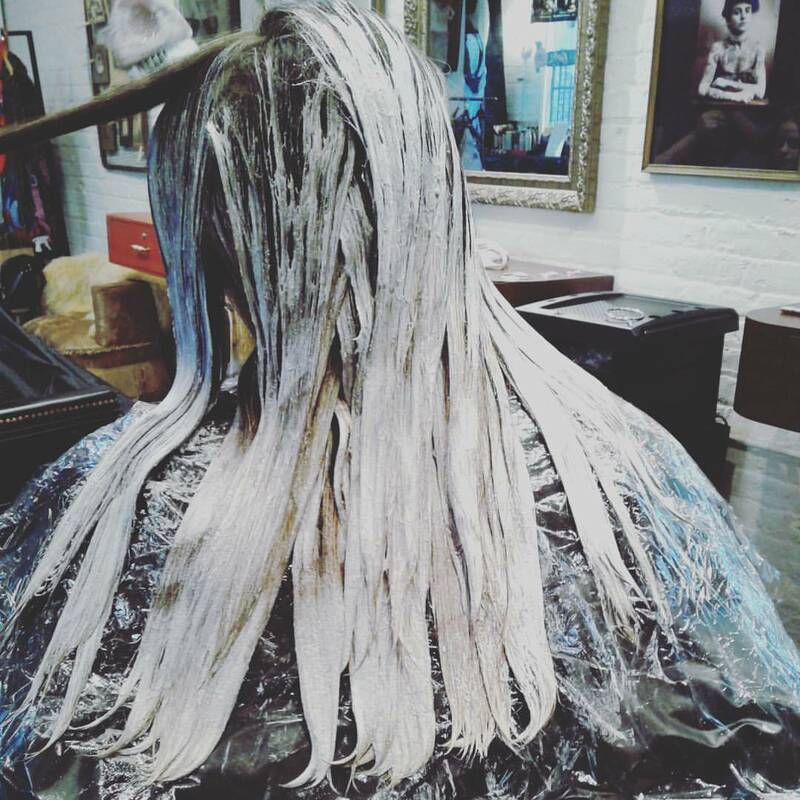 We offer Olaplex to our color service to help keep and maintain the integrity of the hair. 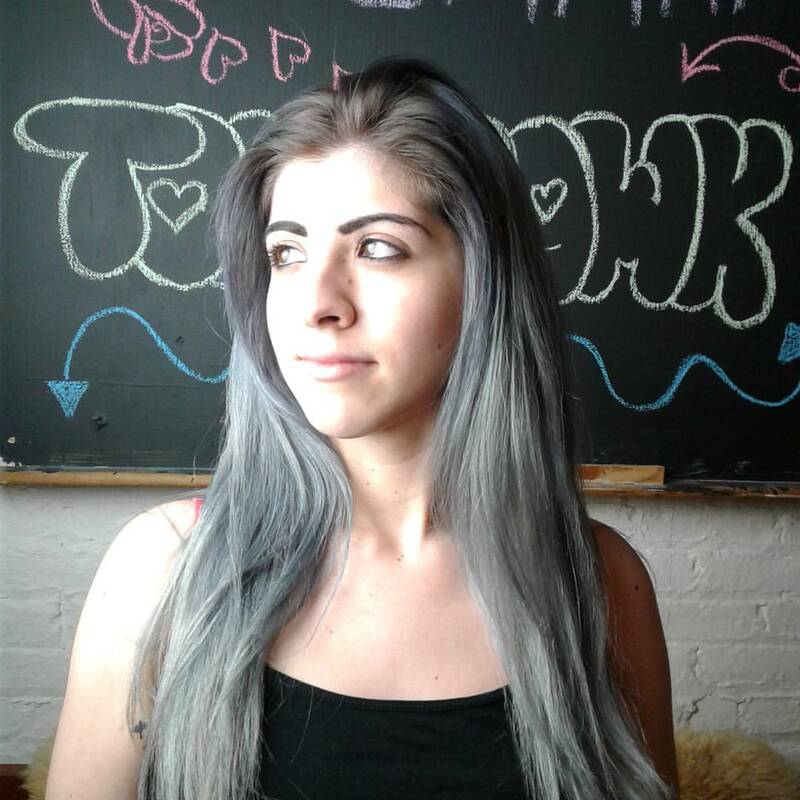 Natalia Michele did an all over double process to achieve this silver white hair. Virgin snow indeed! Now let us say bye bye gray hair. Our gorgeous client just become a mother she needed something low maintenance to cover the grays. Kristin Jackson went with a full balayage to help blend the grays. This is great option instead of permanent color. As we gray we need to go lighter with our color. Doing permanent color either to conceal or darken hair is more maintenance about every 4 weeks compared to the balayage at every 4 months. Here’s why, contrast. Gray hairs will pop against dark hair where if we lightened the strands there is less contrast. For real going gray is a struggle, a balancing act, to resist or to embrace. Hopefully we can make it a lil easier and guide you with what’s best for you and your lifestyle. Check out our glam client below. Here is Kristin doing her magic. A full balayage in process. This is a hand painted technique. The ends are more loaded with lightener as Kristin blends upward almost to the root. 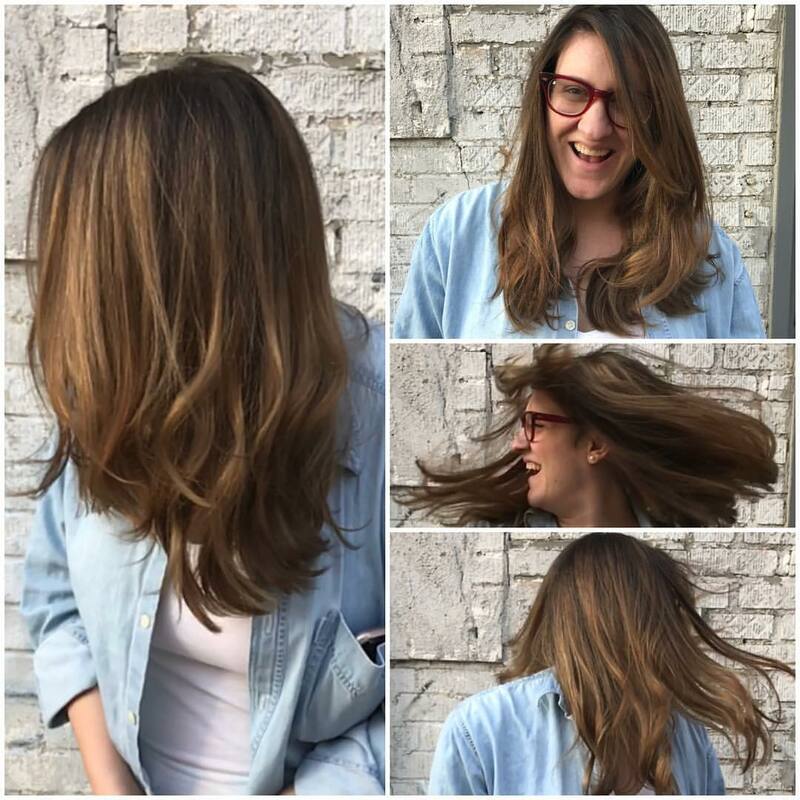 Results Kristin Jackson Did this full balayage to help lighten the strands and blend gray hair. Say bye bye grays and hello sun-kissed! As always we highly recommend booking a consult for color appointments. It’s free and generally takes 15mins. Consults help us evaluate, price and get on the same page as our clients. Remember Life’s a bleach and then you dye! Let’s make your hair dreams come true call or text 646-399-6873 for consults and appointments. This entry was posted in Uncategorized and tagged balayage, bushwick, doubleprocess, grayhair, greenpoint, hairinspo, hairsalon, nychair, olaplex, pravana, redken, ridgewood, shorthair, silverhair, tomahawksalon, whitehair, williamsburg. Bookmark the permalink.